There are few things I love writing about more than a good fashion + beauty collaboration. If you fell in love with the NARS Andy Warhol collection a couple months back, you’re sure to love the brand’s colorful collection with French shoe & accessories designer Pierre Hardy. We’ve got the scoop on this Summer 2013 style, right here! Pierre Hardy is a chic, ultra-modern designer who brings geometrical prints and spicy colors to runways season after season. 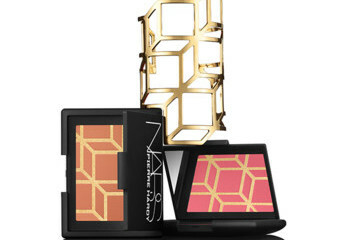 For this NARS collection, Hardy’s innovative colors and patterns are proudly displayed in collectible, trendy cosmetics! Fun prints with a distinctly illustrative quality bring some serious pop to cheek colors. The two shades, Boys Don’t Cry (pink) and Rotonde (coral) are inset with a dramatic highlighting gold powder that looks just like Pierre Hardy’s collection’s cagey cube bracelet! If you committed our Pantone color trend guide of the season to memory, you’ll notice that a lot of this collection’s hot nail color shades were definitely ones to look out for! Lavender, yellow, nectarine and nudes will transition you from spring to summer. The stylish pairs have powerful names, too: Ethno Run, Easy Walking, Vertebra, Sharplines, Sharks, and Venomous. The initial footwear inspiration of this collection doesn’t end at the bold shades or structural designs. Coordinated nail lacquer duos come housed in tiny “shoe boxes” that are almost too cute to get rid of! (How about storing your jewelry in them?) Even the graphic quality of the cube packaging mimics Pierre Hardy’s cube-within-a-cube designs. Colorful cubes can be spotted throughout Pierre Hardy’s designs, even as polished embellishment on this already bold envelope bag. These pieces successfully combine two always stylish trends: summery colors and simple, eye-catching patterns. What do YOU think of this artistic collaboration? Are you inspired to create 3D nail art or bold, geometrical patterns? Just love your posts. You always find the greatest stuff!